Leanne strives to gift her readers with heroes and heroines they can fall madly in love with, and a storyline that brings them together under the best--and often most impossible--circumstances. She credits her success to her tenacious family who never let her give up on her dreams. A proud (and homesick) Alaskan, she now lives in Lower Mainland British Columbia with her daughter and Canadian husband. She hopes you fall in love with her heroes and heroines as much as she has. Prior to writing her first fiction only a few years ago, Dee S. Knight lived a varied lifestyle. After college she married her high school sweetheart and they became house parents at a home for wards of the court. Thus, she went from newlywed to "mother" of a dozen teenage boys, in a month. Two years of living in one city proved to be enough, and she and her husband spent the next eight years as long-distance truckers. Swiftly following their trucking years, she became a computer consultant, high school and adult ed teacher, technical writer and novelist. More than thirty years later, she's still married to her own hero and finds life infinitely interesting. They currently reside in the Midwest. Ms. Karmazin utilizes a unique blend of multicultural knowledge for her Science Fiction. When she was seven, she read George MacDonald's "The Light Princess" and became an avid reader of Science Fiction and Fantasy. She incorporates the same sense of adventure and wonder to her SF stories. During 1999, 2000 and 2001, three of her short stories were published in Hadrosaur Tales, a print SF magazine based in Las Cruces, New Mexico. 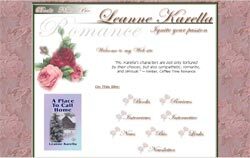 Have A Favorite Romance Author K? Do you have a favorite Romance Author whose last name begins with "K"? Share it! "K" Romance Authors" Tell us about yourself and your latest Romance Novels!